The following three members organize this platoon: rapper ILL-BOSSTINO, track producer O.N.O., and live dj DJ DYE. They have a rather cruel habit, which they never seem to omit. They have people call them many other names, like “RUN THC”, “THA ARIEN COMES FROM MUD PLANET” and “THA MEN WHO BRING STORM”. THA BLUE HERB was organized at Sapporo in 1997. Since then, they have released many works on their own label, based in Sapporo. 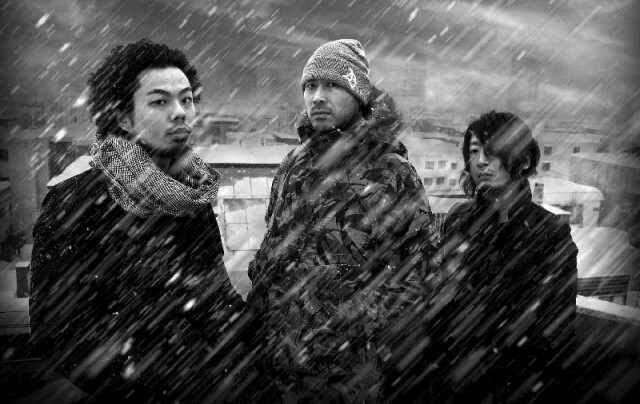 Their lyric, beat, and attitude are very different from existing Japanese hip-hop, and they incurred antipathy, disorientation and aversion from the more conservative listeners at first. But later they obtained much consent and support step by step, and over time had a big influence which served to divide the Japanese hip-hop scene into two parts. They rarely appear in the media, and as of 2004 their only appearances are the live performances they’ve had in more than 100 different places in Japan. Through the crash of sound and word, this one MC and one DJ bring about an emotion that challenges and liberates the consciousness of Japanese music fans. They released their first full-length album in 1998: “STILLING, STILL DREAMING” and in 2002, they released the second album: “SELL OUR SOUL”. In 2004 they produced an original soundtrack for a movie called “HEAT” and showed their ability to a wider public. In July 2005,”THAT’S THE WAY HOPE GOES” was released as their first picture work which condensed the group’s progress during eight years. While holding onto hip-hop soul, they take various other elements of music into their songs and make a chance for exchange between many artists of all genres.